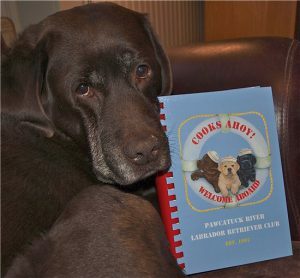 This 200-page hardcover cookbook contains almost 300 tantalizing, mouth-watering recipes contributed by club members and past specialty judges (conformation, sweeps, obedience, and rally), as well as beautiful images of Labradors and entertaining quotes about dogs and food. 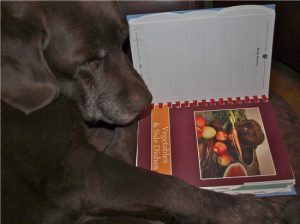 A portion of the proceeds from the sale of each book will be donated to the AKC Canine Health Foundation. See below for a sample of what you will see inside this fun book. 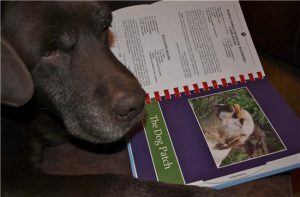 ” The Dog Patch” section is All For Dogs! 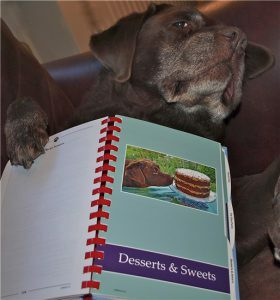 The “Desserts & Sweets” section you will not be surprised, is the largest section and full of incredible yummy treats for us two legged beings! And “Vegetable & Side Dishes” . 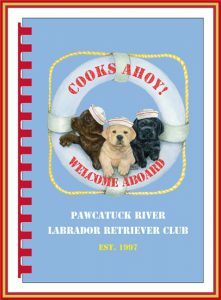 Just a sampling of the images you will find when you receive your copy of the PRLRC “COOKS AHOY~ WELCOME ABOARD” cookbook. To accompany the club’s new cookbook we are offering Dishtowels and Aprons with the book’s cover design. These items will make great gifts to go along with the cookbook if you are giving one to family and friends.